"You can run and you can hide, but I'll find you"
Amethyst was a former Junkion. Over time, she began to dislike the life style Junkions lead. Always watching TV, not taking as fluid as other Transformers, and falling apart constantly. When she found out about LONAC, she decided to see what it could offer her. Upon her visit the LSS Freedom was attacked, and proved she was a very good warrior in the battled that ensued. Dark Star offered to rebuild her into the type of Transformer she wanted to be, and she agreed. In her new body she has increased confidence levels and will stop at nothing to take down her enemies. In robot mode, Amethyst carries two low powered handguns. She is very agile and can use them to phase the enemy until she can engage in hand to hand combat. She's an expert street fighter, and prefers close combat to long range combat, although she is good at both. For long range battles, she uses her gun and shield with a fair amount of accuracy. 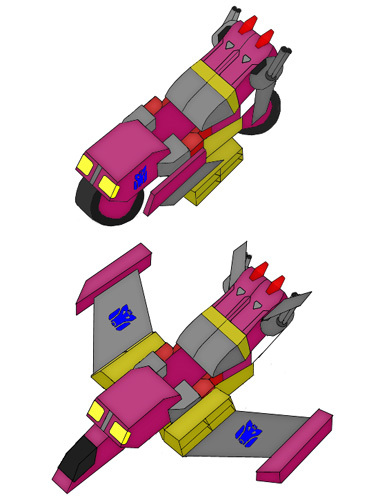 In motorcycle mode Amethyst is very agile and uses her two hand guns as side mounted weapons. Since they aren't very powerful she'll often take on a rider with a powerful weapon, although anyone will do in a pinch. Even with a rider, Amethyst can reach speeds of 300 miles per hour. In jet mode, Amethyst can travel near the sound barrier. Her leg mounted guns serve as the primary weapons in this mode, but she can still use her hand guns if need be. Amethyst also forms the left arm of Razer. Amethyst joined LONAC because Dark Star offered to rebuild her. She disliked her Junkion body and wanted one that wouldn't fall apart right away in battle. Having been a Junkion, she felt as if she was neutral already; Dark Star's offer tipped the scale.